Stephen Walker is a creative photographer who loves telling stories through photographs. In his series of blogs on wedding venues from a photographer’s perspective, he covers our beautiful venue with some stunning photographs from an exclusive shoot. When it comes to choosing an iconic Liverpool wedding venue, the Royal Liver Building has to be the stand out choice. This post is part of a series of blog post on wedding venues from a photographer’s perspective. All venues have their own character and style. I’m sure they all have great staff, spaces for guests, great food or connections with caterers. BUT HOW DO YOU KNOW WHICH ONES ARE GREAT FOR PHOTOS? Your wedding photography is all you have left to look back on once your day is over. So, is your venue a good venue as far as photography is concerned? This doesn’t necessarily mean how pretty the wedding venue is. There is much more to it than that. 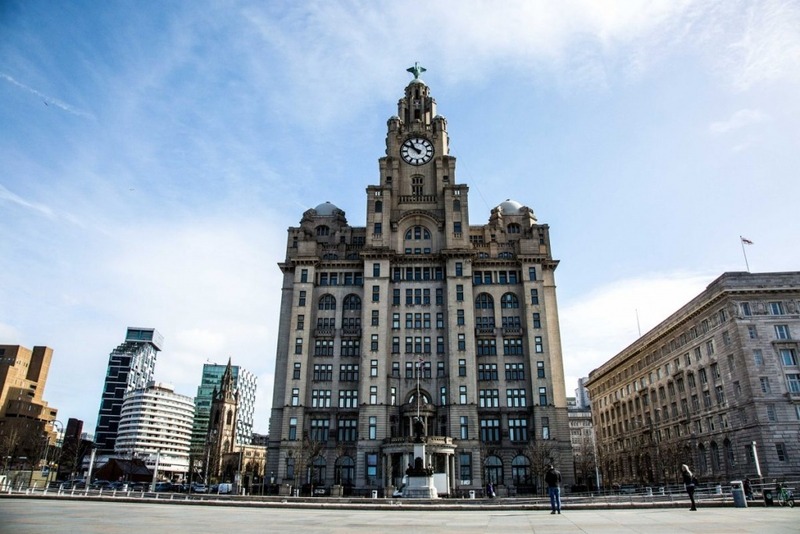 Here is a brief overview of The Venue at the Royal Liver Building from a photographer’s perspective. Photography, as many photographers will tell you is all about light. Natural light is beautiful and comes in many forms from noon sun to dusky sunsets. Natural light will help create the most beautiful photographs. One main advantage for this wedding venue is the natural light available. Its huge rooms and large windows are perfect for any photographer to capture emotions and the story of your day as it unfolds. Not only does it have big windows, the views out of these windows are awesome. If it’s not looking across the river Mersey then you have the historic Cunard building right next door. The building itself can look really dramatic from the outside if you look at in the right way. I love shooting in the city. Just like this shoot here of Charlotte & David. The Royal Liver Building would look amazing in the background of any wedding photos. Even putting the building aside, it’s just a stone throw away from the river’s edge which again would make for some spectacular images. It’s small but intimate bridal room would again make fabulous images as the light in there is fantastic. The tall windows fill the room with light. Dropping light from up high as well as direct through the window. See the image below. This place has lots of natural light with lots of great backdrops for some natural images outdoors along the river or closer to the building. A great iconic place to marry if Liverpool is your thing. The team that run The Venue are great and I have worked with them on a couple of projects in the past and was super helpful when needed. Here are some images I took to inspire me in writing this post. Find out more about celebrating your special day with us in our iconic venue or contact us directly as we would love to discuss your wedding. We regularly host wedding open days – you can find out when our next one is here.